German Marder II tank destroyer with captured Soviet gun (full name 7,62 cm PaK (r) auf PzKpfw ll Ausf D Marder II (SdKfz 132). December 20, 1941 Alkett company received an order for the installation of captured Soviet divisional gun F-22 model in 1936 on the chassis of a light German tank PzKpfw ll Ausf D. Gun F-22 has been in large quantities seized by the Wehrmacht in the first weeks of the war against the Soviet Union and modernized German engineers: in particular, was introduced muzzle brake. For gun F-22 production of ammunition was established in Germany. 76-mm armor-piercing shell 39 Pzgr left the barrel of the gun at a speed of 740 m / s and at a distance of 1000 meters past the 82-mm armor. 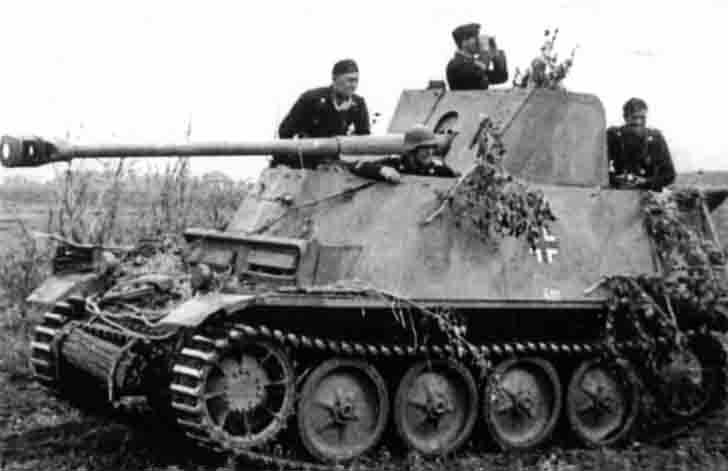 Marder II also carried a German 75mm Pak 40 anti-tank guns.